Kate considered that for a moment. Why was he invited to the dinner party? Because Ada likes to gamble? Kate watched as a red-faced and clearly agitated Jane stormed in and out of the reflection. 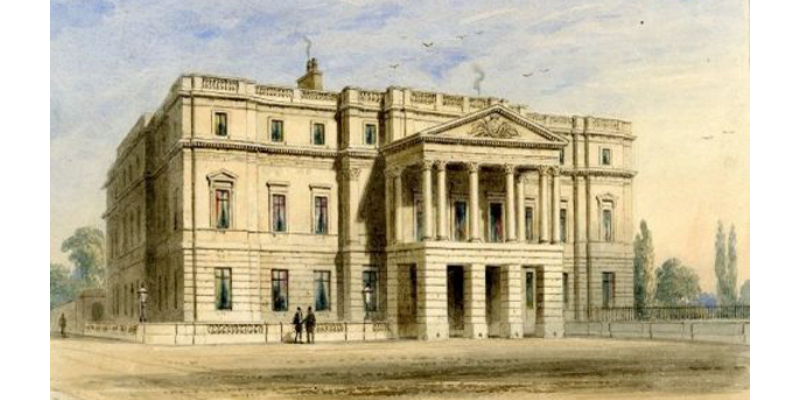 Kate glanced out a window as they made a turn and saw a line of carriages waiting to discharge their occupants in the porte-cochère under a Corinthian-styled balcony of Stafford House, the palatial London home of the Duke and Duchess of Sutherland. She was relieved to see some children with their parents entering through the broad doors. Her father and Jane spoke lowly about strolling in Green Park after the recital. Kate didn’t digest their words. Her nerves quivered. She needed to get inside and find somewhere safe from which to observe people, to ensure she wasn’t the subject of unsavoury rumours. The front (north) entrance of Stafford House as rendered in 1856. “How is Lady Kate Lion-heart?” Countess Ada Lovelace, asked loudly. Kate blinked in surprise and glanced rapidly from face to face of the adults looking at her, some smiling, some puzzled. Annabella, the Lovelace’s eleven year old daughter, skipped to Kate’s side. Kate crouched to give the diminutive girl a hug. “I’m fine, thank you,” Kate replied, over Annabella’s shoulder. “None other,” Countess Lovelace replied with a mischievous smile. She took Earl Beaufort’s elbow. “Shall we find Lord and Lady Sutherland? What do you make of the developments in Austria and the German States? Do you feel…” Her words were lost in the general clamour of the crowd. Earl Lovelace offered his elbow to Jane, and they followed. “May we walk together?” Annabella asked Kate, barely above a whisper. “Of course.” Kate took her hand. Annabella’s brothers, older Byron and younger Ralph, brought up the rear. They climbed a few steps while passing between polished marble pillars, and entered a large central hall. “She’s been calling you Lion-heart for weeks,” Annabella said. “To whom?” Kate asked, curious and afraid. “I will? !” All the men?! Conversation ceased as they came to a staircase where the Duke and Duchess of Sutherland greeted the guests. Kate, despite her whirling head, finally noticed the opulent surroundings. Red carpet, marbled walls, enormous paintings, classical statuary, a grand split staircase leading up to pillared walkways, and windows three stories above let in sufficient light to shimmer upon the golden gilt ornamentation. The Duke of Sutherland, somewhat deaf, smiled and shook hands as he accepted yelled greetings, allowing the Duchess of Sutherland, Mistress of the Robes, to do most of the talking. When the men did converse for a moment, Kate was called out from the children for an introduction to the Duchess of Sutherland. Kate felt the woman looked her over like a hungry cat with a delectable mouse. Harriet Sutherland-Leveson-Gower, Duchess of Sutherland, by F.X. 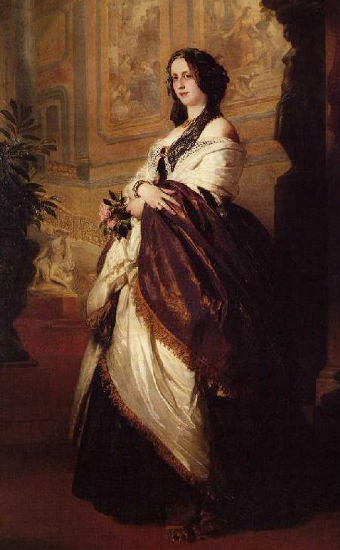 Winterhalter 1849. She stands in the northwest corner of the central hall of Stafford House. “I knew your mother,” the Duchess of Sutherland stated plainly as Kate completed a curtsy. Kate lowered her chin for a moment. What do I say about a parent I know only from portraits? I wish I did know my mother. “Have you met our son George?” the Duchess of Sutherland asked. “No, your grace,” Kate replied, noticing Jane drawing nearer. Kate perceived this as an invitation to be presented as a possible match to the future Duke of Sutherland. As much as she hated the idea, she knew what to say. Then Kate took Annabella’s hand again, climbed the last stair onto the landing, and walked around the Sutherlands to wait beside her father, both of them by far the tallest in the conversation, except Earl Lovelace. The Duchess of Sutherland eyed Kate a moment, then greeted the next guests. Kate hoped, perhaps, her manly height would dissuade the Duchess of Sutherland of further interest, but her statuesque physique might also be considered attractive, so she couldn’t know. The Beauforts and Lovelaces continued up the stairs, ambled along a walkway, entered a drawing room, then split into two parties, the adults proceeding into the gallery while the children went into a larger drawing room. About three dozen well turned-out children of various ages waited within, pockets of boys and girls talking animatedly. Kate knew some of the girls and boys were older than her, but she felt mature beyond their years. Her full-length dark green taffeta dress (tastefully trimmed with pink and red silk flowers) and ruby jewellery seemed very adult. She took a chair near the centre of the room, as the groups were around the edges, and perched very straight and still, her head up, but her eyes cast down. Annabella sat beside Kate and they chatted about what they’d been reading, settling on Varney the Vampire as an amusing, terrifying, sensational, and poorly written subject. “Someone is spying on you,” Annabella whispered. Kate raised her lids and saw two gentlemen of perhaps twenty-five years of age standing a little beyond the doorway, staring at her. I don’t know them. They could be members of the same club as Mr. Roylance! What might they be saying about me? When eye contact was made the men turned and walked towards the gallery, out of view. Then Earl Hugh Grosvenor, the Member of Parliament for Chester, came to the threshold with some of his younger brothers and sisters. He immediately entered and approached Kate, with Bert and Janey on his heels, and their youngest siblings, Richard and Theodora, splitting off to join playmates. Kate stood, feeling genuinely happy to see old friends. “How you’ve changed,” Kate said to Janey, a girl about half a year younger than her, as they hugged. Hugh turned a shade of red, but stood his tallest and grinned at Kate. She appreciated his clear and kind well-proportioned face, with a long nose and round chin, and smiled in return. A pang of regret stabbed Kate’s heart. Have I? I would dearly love to have play days with friends. “Hard to believe we were pretending to be pirates a few years ago,” Bert said. “Not too great, or dangerous,” Janey said. Bert and Janey exchanged arched brows, then backed away. Hugh carefully took Kate’s arm and guided her near the open doorway. Kate noted his gallant manner and use of formality. “I want to thank you, Lady Kate, for replying to my letters,” he said. “We do not have an understanding,” Kate said firmly. Hugh hurried into the small drawing room just as several of the Sutherland children entered from the walkway. Lady Constance, a girl turning fourteen in June, wearing a lovely pale blue house gown, marched up to Hugh and fired an icy glare at Kate. In the year that had passed since Kate first met Constance, the girl had grown a bit, and altered her demeanour. She clearly possessed improved confidence. Kate backed away and saw words spoken, then Constance stretched up and pulled Hugh over to peck his cheek. Hugh strode from the room into the gallery. Constance entered the large drawing room with her siblings. Kate retreated to the chair beside Annabella. Lord Frederick, the Sutherland’s fifteen year old son, closed the door and waved for silence. “Can we stay in here?” a boy asked. The young lords and ladies filed into the small drawing room and lined the walls, staying well clear of the doorways of the walkway and gallery. Kate hooked Janey’s elbow and held Annabella’s hand. She felt like a governess with her wards. “When did you first see Queen Victoria?” Annabella asked. “After.” Kate smiled at the fond memories. “Father had duties to preform, so Jack took me to dinner. Then we went to a curiosity and toy shop. He bought me a rag-doll rabbit, made of yellow velvet. I still have it.” Although it is a little faded, grimy, and tattered. Four very tall and extravagantly attired footmen entered the room and took positions on either side of the doorways. They waited in silence for perhaps a minute, then voices and footsteps grew steadily louder. The children let go of each other and stood to attention. Queen Victoria swept into the room with Prince Albert, escorted by the Sutherlands, and followed by the royal couple’s two eldest children, the seven year old Princess Victoria, and six year old Prince Albert Edward. They all wore quality clothes, but appeared plain compared to the footmen. Queen Victoria as she looked in the mid 1840s, Prince Albert 1848, Princess Victoria 1848, and Prince Albert Edward 1847. Kate put a hand to the large ruby brooch at her throat. Am I dressed better than the queen? That must be a social blunder… oh, but many of the ladies are wearing finer outfits then me. Kate performed her best curtsy as the Royal Party passed. The Duchess of Sutherland and Queen Victoria exchanged hushed words. Prince Albert nodded left and right, quietly giving his thanks to the children. The princess and prince smiled and waved at any recognised acquaintances. Within the gallery someone loudly announced the arrival of the queen, and there was an explosion of exclamations and movement, then silence. A murmur of discussions ensued, then the children entered the gallery, some hurrying around the outside of the occupied rows of chairs. Kate, wanting to remain as invisible as possible, sidled in beside some seated ladies near the door with Annabella, but a footman then led them up to the main portion of the gallery, not far from the piano! Kate wanted to turn back, but Annabella held her hand tight and dutifully followed the footman. From their position they could see the Royal Party and noblest guests seated closest to the beautiful piano, and the polished ebony and ivory keys themselves, waiting for the virtuoso pianist. Kate, trying to hide, gently gathered Annabella into a position in front of her, loosely wrapping her arms across her upper torso in a hug, letting the girl lean back on her body, while Kate used the wall for support. Kate searched the crowd for her father and step-mother. She spotted Hugh and some of his siblings sitting with their parents, Richard Grosvenor, Marquess of Westminster, and his wife, Lady Elizabeth, a sister of the Duke of Sutherland. They were positioned behind the Sutherlands, who sat to the right of the Royal Party. Kate noticed a man of about twenty years of age beside the Duke of Sutherland, and suspected him to be George, the eldest son. She didn’t like the look of him; his suit and hair unkempt, a sullen face with sleepy eyes, and he slouched in his chair. Broken applause started as a small pale man walked slowly from the far entrance of the gallery, then a loud ovation greeted him. He stopped and bowed to the queen, and they spoke lowly in French. Kate discerned the man wasn’t fluent, which surprised her, as she knew he had lived in France over a decade. “That’s Monsieur Chopin?” Anabella whispered with a sceptical tone. Chopin sat at the piano and started to play. Everyone fixed their attention, perhaps two hundred people, motionless, listening intently. Kate watched Chopin’s hands for the first two pieces, and started to feel hypnotised. She let her mind wander with the music, and stared at the massive paintings, the ostentatious golden decorations, the soaring ceilings and skylights, her emotions lifted by the music. She snapped wide awake when Prince Albert rose and slowly stole to a position where he could witness Chopin’s hands as they worked magic upon the keyboard. He stood close to Annabella and Kate, and she felt the girl grow tense in her arms, and not relax until the prince resumed his seat. The gallery at Stafford House the venue for a matinee recital, 1851. This event would have been less formal than Chopin’s visit. When the recital ended everyone rose and remained silent as the Royal Party departed. Kate overheard something about the queen hosting a court function that evening. Some children scampered from the gallery, but most simply found their patents in the noisy crowd. Kate briefly hunted the room on tiptoe to locate the Lovelaces and deliver Annabella to the care of her parents. Earl Lovelace held a firm grip on Byron’s collar, making Kate wonder what he may have been up to, while Ralph had either ran off to the drawing room or was lost in the tumult. Annabella nodded and clapped twice in enthusiastic approval and anticipation. “Perhaps,” Countess Lovelace said with a crooked smile. “Certainly! The lioness is a noble hunter. It will add mystery to your allure. The young gentlemen will be intrigued, and cautious!” Countess Lovelace laughed. Ralph emerged from a mass of skirts, pushing through them like a jungle explorer, accompanied by a chorus of high-pitched exclamations. Annabella gave Kate a solid hug. Earl Lovelace started for a door, guiding Byron, followed by the rest of his family. Kate found herself in an open patch of floor, quite alone, yet all around her busy knots of people. She started a slow circle, trying to find her father, and became aware of many young men nearby. Kate thought they were whispering and stealing ganders at her. She lowered her chin, and peeked back through her eyebrows, wondering what they might be saying, then remembered herself, raised her head high, and assumed her angry arrogant expression. Although trembling inside, she strode determinedly through the open spaces, and located her father at the south end of the gallery. Upon finding him, she relaxed, lowered her eyes, but stayed a dozen paces distant because he was in conversation with Hugh Grosvenor. Before she could speculate on the significance of their dialogue a feminine voice called her name. Kate tensed and swivelled around. Constance approached, well within her rights to demand Kate’s attention since she outranked her and they had been previously introduced. Kate, caught off guard, still managed a decent curtsy, and took the time to compose herself. Her initial impression of George wasn’t enhanced by this closer encounter. She stood taller than him, and looked down on his large head, sloped shoulders, and ill-fitting attire. “How do you do, Lady Kate,” he said, and stuck out a hand. “How do you do, Lord Stafford.” Kate took the offered greeting and he shook her hand like a man, so Kate squeezed and shook back hard. He smiled as they released their grip. “Did you enjoy the recital?” he asked. “Very much, thank you.” Kate reconsidered him in a favourable light. He seemed the same sort of unpretentious gentleman as his father. Kate glanced sidelong at Constance. How does she know that? “Play something for us now,” Constance said, rather like a command. Dread bubbled in Kate’s stomach, then turned into a hot stone. She timidly scanned the piano, all the people. “I…” Her throat constricted. Kate hadn’t heard of such a practice, but understood the wisdom of preserving the flounces of a skirt. The panels of fabric could be ironed, but the lace trim required greater care. Kate’s skirt was already creased. “I will, then,” George said with a shrug and shuffled towards the piano. Kate felt following him was her only option. I’ll have to play after George! What should I do? What should I do? The stone in her stomach burned hotter. She slipped a handkerchief from a pocket, preparing to surreptitiously dab perspiration from her face, but too many people were now staring, and it wasn’t merely the men whispering together, Kate perceived young ladies casting haughty expressions in her direction. This isn’t right. They should be on display, not me. The débutantes will all hate me for taking the attention from them. This is a bungling muddle of colossal proportions! First I stood by the piano during the recital, now I’m going to perform? George sat at the piano and played a simple and lively rendition of Bluebells of Scotland, making a few mistakes, smiling sheepishly at his errors. When he finished everyone nearby applauded. He stood, and motioned for Kate to sit. She eased herself onto the ornate bench, shifted, tentatively plunked a few keys, her head down. “How about something by Monsieur Chopin?” Constance suggested. Kate didn’t look up. What?! He might hear me. I can’t do that! She felt repulsed by the idea of playing anything other than a popular tune, and started Vive La Compagnie. George leaned on the piano and hummed along. As Kate finished flawlessly she heard applause, rose with some relief, stepped away from the bench, and curtsied to George, who bowed his head and smiled. She didn’t wait for words to be spoken, or to take her leave of Constance, simply spun on her heels and glided to the south end of the gallery, hoping her father would still be there. He was, and Jane, and the Marquess and Marchioness of Westminster, Hugh no longer present. As Kate drew near, the Westminsters departed, and she thought the Marchioness shot her a hostile glare, which caused hurt and confusion, because the woman had always been kind to her in the past. “Lord Grosvenor asked to call upon your father,” Jane said excitedly to Kate. “I told him he might,” Kate said, hearing someone else start playing the piano. “You encouraged him?” Earl Beaufort asked. Kate hesitated, and knew her silence to be an unsatisfactory response for her father. “This may cause a problem,” he said with a frown. “Why?” Kate asked, sensing turmoil, her nerves frayed by weeks of worry. “What did you make of him?” Jane asked. Kate knew Anne, a girl of nineteen years, and thought of her as hard-faced, and solemn. They stepped into the small drawing room, Kate dabbing her eyes. She wanted to get downstairs and through the front door without facing anyone else. Of course, that didn’t happen. Baron William Ward, large and gregarious, appeared before them. For Earl Beaufort to press by without saying hello could only be interpreted as an insult, so he stopped, but Jane took Kate’s elbow and adroitly manoeuvred around the men, then between other knots of people. They moved along the pillared walkway, Kate sneaking some peeks at the crowd below in the central hall, and descended the first flight of stairs. Kate spotted the Sutherlands standing on the landing and wanted to turn back. At that instant the duchess looked up and locked Kate’s eyes. Once again, Kate felt like a delectable mouse, this time walking straight towards the waiting cat. Recognising Jane’s thoughtful efforts to facilitate an escape, Kate nodded. “Pardon me?” the Duchess of Sutherland’s cheeks flushed and she retreated a step. “Good day, your grace,” Jane said quickly and bobbed with a perfunctory curtsy. “Your grace,” Kate echoed coldly, executing a long low majestic curtsy. She rose, hooked an elbow with Jane, then they continued down the last stretch of stairs. “Did you see her face?” Jane whispered as they promenaded from the central hall. Kate remained silent, head held high, letting the heat of her fury dissipate. Again, Kate said nothing, recollecting words and incidents of the day. “Will you still see Hugh Grosvenor when he calls?” Jane asked.